The walls and support columns are rising! Inland Construction site manager Mike Ingram reports that "The project is looking good. Slab should be poured in the next two weeks and the second floor slab soon." Know what the last picture is? The window for the ground-level mechanical room, just behind and below the formal parlor bay window that will face Leadership Drive. After losing four days to rain and mud last week, the bulldozers, excavator, and dump truck have been busy this week! Fence is up and it's a real construction site. Our loan with BB&T finally closed on Friday, May 29. A special shout out to loan coordinator Jen Henson and attorney Theresa Dew. We highly recommend them! Inland Construction began site work on Monday, June 1. We engaged the services of real estate attorney Theresa Dew to review and advise us on all legal documents related to the new house. Theresa has the perfect skill set, having also represented Kappa Delta and Sigma Nu, the first two groups to build houses in Phase I. With the guidance of John Mountz, we planned the launch of the All Hands on Deck phase of the Capital Campaign to raise the $265,000 we still need to make building the house financially feasible. We created an e-newsletter and social media accounts branded as Delta Gamma at 2300. 2300 Greek Village Drive will be the address of Delta Gamma’s new home at NC State. Most significantly, Delta Gamma Fraternity offered an unprecedented loan to make it possible for us to secure a commercial loan. Last week, we met with Jim Compton of Cline Design and Jim Edwards of Inland Construction to review final plans and cost breakdowns. We learned that the cost of materials has risen roughly 7 percent in the past year. On Thursday, we cleared the City of Raleigh review process for all permits required to build a Delta Gamma house on this lot. Sunday, March 22 we celebrated Ground Breaking for the new house! Charlotte alumnae are very excited about Eta Kappa's success! Charlotte alumna Jenny Lapham Blackmon, Gamma Psi-Emory, hosted a January 10 home event that raised over $11,000 (so far) for the Capital Campaign. Eta Kappa House Corporation has retained Raleigh real estate attorney Theresa Dew. She represented Kappa Delta and Sigma Nu, so she already knows the Greek Village project and NCSU personnel. She will review all financial and construction documents for us. Amy Young Morrison, Eta Kappa, Chair of the the House Corporation Landscaping Committee, plans a 31 January work day. Liz Williams, Eta Kappa, has agreed to chair the House Corporation's House Management Committee. We have reached a HUGE milestone in the journey to A Home of Our Own! 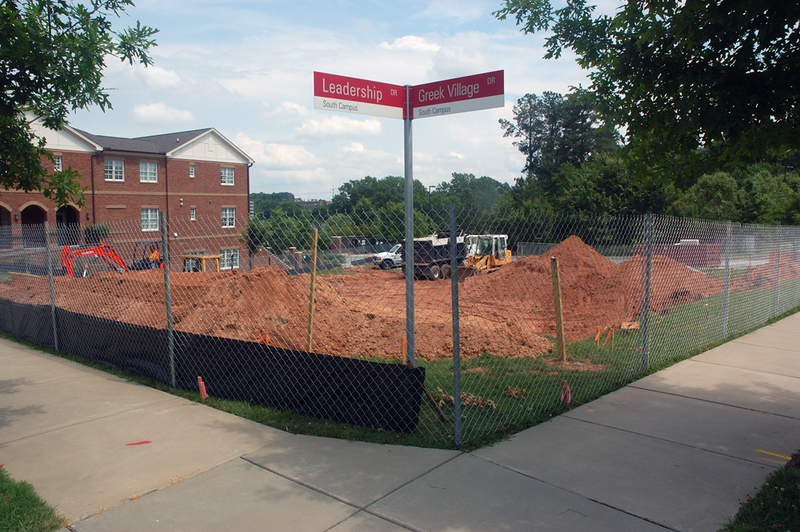 We have secured financing for the new Eta Kappa Chapter house in NCSU's Greek Village! Nancy Gray Schoonmaker, Gamma Phi-Arizona State, Eta Kappa HC President, signed and submitted a construction/term loan commitment letter to Branch Banking and Trust Company (BB&T) on December 31, 2014. Eta Kappa chapter alumnae Mandy Howard Young and Lindsay Burns put together a watch party at Clouds Brewery on November 1 for alumnae, friends, and family to cheer on the Wolfpack against Syracuse. Mandy and Lindsay really put the FUN in this fundraiser for the Capital Campaign, and contributions are still coming in. Mandy announced that we will be breaking ground in Spring 2015, and project consultant John Mountz explained that we can get financing based on our fundraising and project equity to date. However, if we raise another $250,000 before we break ground the chapter will have more manageable interest payments in the future. Lots of new connections were made, a wonderful time was had by all, and the Wolfpack beat Syracuse. A perfect afternoon! Eta Kappa Chapter’s House Corporation has selected Inland Construction Company to build our new home in Greek Village. Jim Edwards of Inland is working with Judy Kline Pickett, Gamma Mu-Florida State, chair of the HC Design and Construction Committee, and our architect, Jim Compton of Cline Design, on final design details and cost estimates. Laurie Richards Byrd, Alpha Delta-Oregon, chair of the HC’s Capital Campaign Committee, reports that we have over $100,000 in tax-deductible gifts in our account at the NCSU Foundation, with over $40,000 more in pledges. Delta Gamma Fraternity has approved our land lease with NC State. According to Maureen McCulloh Hollmeyer, Gamma Rho-Wittenberg, chair of the HC’s Finance Committee, once we sign this lease we will have 90 days to secure our financing and break ground. In order to lock in good terms, we need to show the bank 20 percent equity in the project. We need to raise and additional $358,686 in cash before approaching lenders. by building a new Greek Village. scheduled to be demolished in the next few years. we are ensuring the future of Delta Gamma at NC State University. Please help us reach our goal by making a donation to our worthy cause.